Most people understand there's a difference between selling a puppy and selling a toaster oven, but do our laws? It depends where you look. Across the country, puppy mills -- which in many cases are legal -- are allowed to put profits ahead of pet welfare in the sole interest of their own profit-driven desires, churning out puppy after puppy like household appliances on a conveyor belt. The good news is that states are finally addressing cruel breeding and animal selling practices, as well as strengthening industry accountability, with a variety of laws designed to protect and save lives. While some of the laws are stronger than others, they're all no-brainers to those who see animals as more than products, yet many state legislatures are still resistant to regulation. Two current battlegrounds are North Carolina and Illinois, but many more states are tackling these issues. 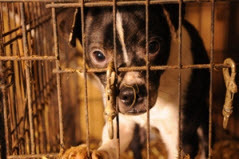 You can play a part in ending puppy mills by refusing to buy anything, including both dogs and pet supplies, from a pet store that sell puppies, as well as supporting enactment of strong state humane laws. While the federal Animal Welfare Act sets minimum standards of care, these standards are grossly inadequate -- enforcement is underfunded and too often lacks teeth. As a result, state and local laws often offer better protection for these animals. Right now in North Carolina, legislation to prohibit certain inhumane breeding practices passed the House of Representatives in 2013 thanks to the strong leadership of House Speaker Thom Tillis. What the Senate will now agree to isn't clear, but we fortunately have great friends in Governor and First Lady McCrory who have made the puppy mill issue a priority. We hope for a successful resolution in the coming weeks as the legislature is in session, but you can still help push this bill through. Last week, Minnesota lawmakers passed the state's first puppy mill bill, which will help vulnerable animals in puppy and kitten mills thanks to the creation of a licensing program, annual inspections, and compliance with minimum standards of care for dogs and cats in commercial breeding facilities. The bill was signed into law on May 20 by Gov. Mark Dayton. This landmark legislation passed in large part thanks to Gov. Dayton's admirable work with local advocates for many years. In Illinois, state legislators enacted a pet lemon law last year to hold pet stores accountable if they sell dogs or cats who later become ill. Very recently, at the urging of Gov. Pat Quinn, a bill was introduced to ban the sale of puppy mill dogs in pet stores. Several communities in the state had already enacted similar bans, making this state-wide push possible. However, with so little time left in the legislative session, this measure will likely not be considered before the legislature adjourns for the summer. Learn how you can still take action. In Connecticut, a bill awaiting the governor's signature holds pet shops, breeders, and brokers more accountable for the welfare of the animals they sell by significantly increasing pet shops' obligation to reimburse for veterinary care, prohibiting the sale of dogs from breeders and brokers with U.S. Department of Agriculture (USDA) violations, and requiring pet shops to post federal breeder inspection reports. New York state law now authorizes local governments to crack down on cruel and unscrupulous pet dealers throughout the state. Until this change was made, only the state could control the fate of the animals in these facilities. As a result, a number of localities and counties have already introduced proposals to regulate pet dealers on the local level. A new law in Virginia requires pet stores to disclose the origins and health histories of dogs they sell, and expands the ability of customers to seek financial remedies if a purchased dog or cat becomes ill. Find out how to thank state lawmakers. California now prohibits the sale of animals at public outdoor venues including roadsides and parking lots. These sales endanger animals, and lead to both increased suffering and overpopulation. Nevada legislators banned the sale of animals at swap meets. Vermont lawmakers passed a measure that improves enforcement of the law protecting breeding dogs and the puppies they produce by providing clear definitions and eliminating legal loopholes. West Virginia passed a strong new law in 2013 requiring commercial breeders to be licensed. It also mandates inspections of breeding premises twice per year and sets minimum standards of care for dogs. Federally, the USDA now requires U.S. commercial breeders who sell puppies directly to the public sight unseen to be licensed and inspected. For the first time, thousands of breeders who sell dogs over the Internet will have to open their kennel doors to regulators. Unfortunately, this leaves out puppies coming in from overseas. That's why we're still working to encourage the USDA to finalize a federal rule requiring non-U.S. breeders who import puppies to the U.S. to provide certification that each dog is in good health, has received all necessary vaccinations, and is at least six months of age. Of course, the puppy mill and dog breeding industries are fighting tooth and nail to keep their industries alive with little or no accountability, which is why we need to be active and vigilant. Though contacting your representatives may seem like a futile effort, we've seen momentous change come from a loud community voice. You can also help by taking the "No Pet Store Puppies" pledge not to buy anything from pet stores that sell puppies, and by encouraging others to do the same. Pet stores typically purchase puppies from USDA licensed breeders, many of whom are frequent violators of the federal Animal Welfare Act, and are allowed to sell even after repeated violations, including denying veterinary care to injured animals, keeping them in filthy and dangerous environments, performing invasive surgeries on their own animals without veterinary licenses, and, in some cases, shooting their unwanted dogs. Our "No Pet Store Puppies" campaign also features over 10,000 photos taken by USDA inspectors at licensed breeding facilities, allowing consumers to see first-hand where pet store puppies really come from. Puppy mills wouldn't be the first inhumane industry to be stopped, banned, or criminalized thanks to public pressure. Child labor, animal fighting, sweatshops, horse slaughter, lead paint, and shark finning are all examples of one-time commonly accepted practices which now fall below the standards of civilized behavior. Strong laws, personal action, and collective outrage can make the price of doing this kind of business too high for even the most motivated entrepreneur. The bottom line is this: Humane treatment is not our gift to animals; it's our obligation. If your state isn't doing enough to keep breeders in check, urge your elected officials to do more. If your community is tolerating puppy mills and pet stores that sell puppy mill puppies, bring the true nature of those businesses to light. And if you think this is a problem that can't be fixed, think again.